Workers from the New York Restoration Project helped plant nine new trees in the garden at Robert Fulton Terrace in June 2012. The group is distributing 625 free trees in The Bronx starting March 30, 2013. THE BRONX — Trees cool the streets, clean the air, dole out fruits and nuts and look good doing it. Now budding Bronx arborists can bring all of those benefits to their blocks by snagging a free tree during a series of giveaways that begins Saturday at Hunts Point Riverside Park. 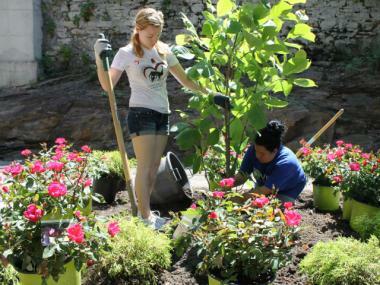 “It’s a great way to improve the city,” said Mike Mitchell of the New York Restoration Project, which plans to offer 625 free trees to Bronxites through April 28. The Bette Midler-founded nonprofit will distribute the trees to five different community groups (see the list below), which will give them out on weekend mornings throughout April. Each giveaway will offer a half-dozen tree varieties, from fig, peach, persimmon and magnolia to sweetgum, cypress, pine and walnut. The new trees will be “subway size,” or about two to eight feet tall, and easily transportable, Mitchell said. Trees provide a host of benefits to individuals and communities alike, Mitchell explained. “For people themselves, it’s all about beauty, attracting wildlife or getting fruit or shade,” he said. People who pick up a free tree can plant it in the ground anywhere in the city they have permission, such as a backyard, the grounds of a willing church or community center, a local park (with the manager’s blessing) or a community garden. Sidewalks and rooftops, though, are off limits. Planting and caring for trees is relatively easy, Mitchell said. First, ruffle the root ball (“give it a bad hair day,” Mitchell offered), then plant it about three times as wide and deep as that cluster of dirt and roots, with the base of the trrunk about a half-inch above the surrounding ground, Mitchell said. Water it for about 10 minutes with a hose once a week and add a pound of compost every six months, he added. The Bronx giveaways are part of an annual citywide tree distribution by NYRP, which in turn fits in with the city’s goal of planting one million new trees. If everyone chips in, Mitchell said, the impact of all those new trees would be profound. Saturday, March 30 // 10:00 a.m. – 12:00 p.m.
Saturday, April 6 // 10:00 a.m. – 12:00 p.m. Location: River Garden, East 180th St. and Devoe Ave.
Sunday, April 14 // 9:00 a.m. – 11:00 a.m. Location: Woodlawn Cemetery entrance at Jerome Ave. and Bainbridge Ave.
Sunday, April 14 // 11:00 a.m. – 1:00 p.m.
Sunday, April 28 // 9:00 a.m. – 11:00 a.m.